Each friend brings up a world in us. I cannot even imagine where I would be today were it not for that handful of friends who have given me a heart full of joy. This Friends Forever Collection from CandleWorks is filled with pretty elements fit for documenting our friendship. 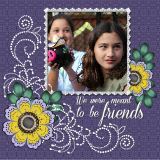 This Friends are Precious Collection from Lynneyboo is full of lovely elements to create some great friendship pages. We hope you will find this dazzling collection from Lynneyboo inspiration to make a few pages about all the great friends you have made on Scrapbook Flair. What would we do without our close friends sticking by us in the good times and the bad? This Friends are Blessings Collection from Jax is a reminder how precious our friends are to us. This is a great opportunity to capture some of those special moments with our best friends. Our true Friends are there for us through all the ups and downs in life. 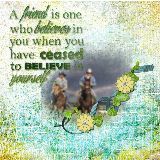 This Friends Collection from SueAngel is perfect to create pages to honor all our loyal friends for all their support. The Our Friendship Collection from Jaelop is a subtle and lovely muted Collection. Create pages for your very best friends with this inspiring and uplifting collection. The Friends Forever Collection from PascaleA is a soft and delicate Collection. 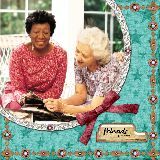 This Collection is perfect to create scrapbook Pages for all your favorite friends. This fun and flowery Collection from Nayyan is perfect to celebrate all the wonderful friendships in your life. So, feel free to honor new and old friends alike. You can never have enough friends and chocolate.